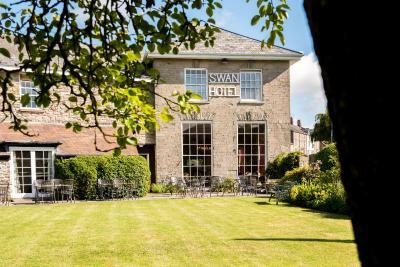 Lock in a great price for The Swan At Hay – rated 8.9 by recent guests! Very friendly and helpful staff. Comfortable and well-appointed public areas. Location in the center of town, yet quiet and restful. Beautiful garden to relax in. Staff was helpful and knowledgeable. Great room especially given that we had a dog with us on this occasion. Dinner was superb. Food delicious and cooked by a chef who really understood his craft. They greeted me with tasty chocolate chip cookies! The bathtub was a dream; modern and fully functional. I was in heaven after having shower-only accommodations for the two weeks prior. The hotel was located perfectly for the Hay Festival, but there was no air conditioning. However, a fan was provided. Plenty of room to move around in the room. The rooms were clean, well cared for. The beds comfortable. Staff helpful. The staff were very friendly and helpful. Our room was well decorated and comfortable, but not very big. Friendly and welcoming staff in a clean hotel with beautiful rooms in a picturesque location ideally located. Food was delicious. The Swan At Hay This rating is a reflection of how the property compares to the industry standard when it comes to price, facilities and services available. It's based on a self-evaluation by the property. Use this rating to help choose your stay! 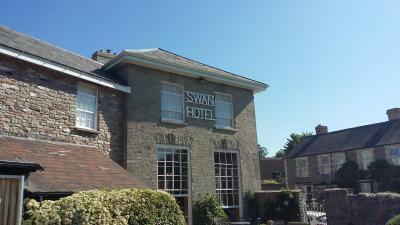 In Hay-on-Wye, The Swan at Hay is positioned between the Brecon Beacons and The Black Mountains. 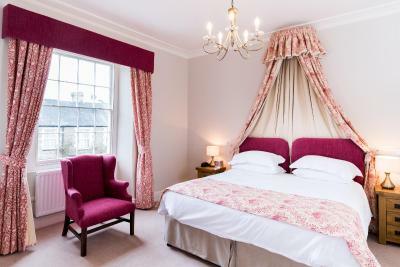 It is an independent hotel with 19 individually designed bedrooms and a restaurant serving classic British cuisine. This listed Georgian building was a former coaching inn, and many rooms have large original windows with views across the gardens or stable block. Bedrooms feature flat-screen TVs, tea and coffee trays and private bathrooms. The Swan at Hay has a relaxed bistro and a restaurant serving modern British cuisine with original Georgian windows overlooking the garden and patio. The Swan has 2 bar areas and a dining room, where guests can choose from the different menus available. The well-stocked bar serves award-winning ales and ciders. Hay-on-Wye has a good selection of boutique shops and pubs. It is only a 5-minute walk from the Offa’s Dyke Path and just a short drive from the Brecon Beacons National Park. Free parking is available at The Swan at Hay. When would you like to stay at The Swan At Hay? 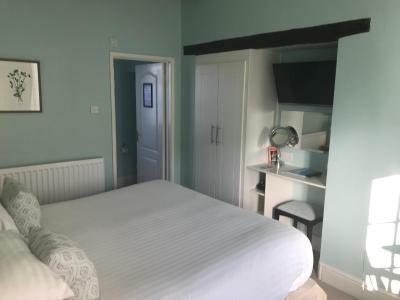 All rooms have a private bathroom with a shower and toiletries, while there is also a flat-screen TV with Freeview and a free tea tray in the room. One of the rooms is in the main hotel and 2 are courtyard rooms. They are popular because of their individuality. These rooms are all different in shape and size and are popular because of their individuality. Some of them have double-height ceilings. Some have views of the garden, while other rooms overlook the Radnorshire hills. All our rooms have private bathrooms, a tea and coffee tray and flat-screen TV. 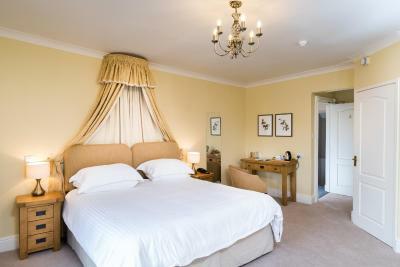 The superior twin rooms are located on the 2nd floor, facing a quiet side-street with views across the countryside. Each room as a tea and coffee making tray, private bathroom and flat-screen TV. 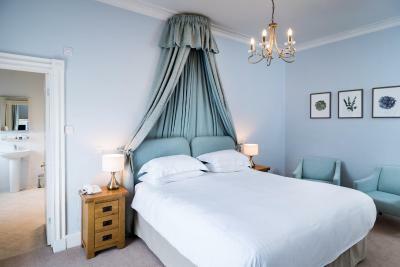 Currently the best rooms in the house, our three deluxe rooms are all on the first floor and larger than our other rooms, providing more space for you to relax. Two of our three deluxe rooms can be used as a twin room. Please advise us at reservation stage of you would prefer two single beds. The Swan at Hay is a quirky and quite unique hotel, a former coaching inn and at the heart of the fabulous book festivals that the town of Hay on Wye is famous for. House Rules The Swan At Hay takes special requests – add in the next step! The Swan At Hay accepts these cards and reserves the right to temporarily hold an amount prior to arrival. Very limited drawer space in room, bath not fully cleaned. Only limited toiletries provided. No bathrobe or slippers provided. Bar area lacked atmosphere (although staff were friendly), chilly evening would have benefited from fire being lit. Breakfast choice good, staff efficient and friendly. Comfy bed. Had good meal at dinner one evening. We liked every thing about our stay and will certainly come again. Noise from bathroom from room next door. Breakfast. View of garden from bedroom. Staff at breakfast. Bed. I can’t fault them to be honest. We stayed because my daughter’s wedding reception was there. Not only was the room beautiful but the staff couldn’t have been any better. They were so helpful, pleasant and accommodating, not only with regard to our stay but also for the wedding. It was a perfect day ended with a very comfortable night’s sleep in a lovely room. Breakfast was lovely and again they were more than happy for me to have something that wasn’t on the menu. Bar service, twice making an error giving full sugar cola to diabetic causing a spike in their blood sugar. Accommodation was average. The hotel had an air of a commercial hotel. We didn't agree with its 4 star rating. Although very comfortable, the bed seemed a little on the short side. Both my wife(5ft 7) and myself (5ft 9) seemed to have our feet over the edge of the bed. Also, the bathroom door could do with some WD-40. We felt a bit awkward visiting the loo at night time incase we woke anyone up! We found all the staff were friendly, helpful and polite and always greeted everyone with a smile which goes a long way. No one likes grumpy staff. The hotel was spotlessly clean. The location was great. Love a cuppa so in- room tea/coffee facilities were a bonus as were the bottles of water replenished daily. My room smelt a little damp on the first day, this disappeared the following day once the room was ventilated. Staff were excellent, very attentive and helpful. Lunch was delicious, couldn't have asked for better. Location is out of this world, with beautiful shops and a fantastic market, it is clear all local businesses support each other where they can. Dirty food tray left in hallway for over 12 hours. Wake up call when NOT requested. No fruit at breakfast on second day because of no delivery. Downstairs bars need some updating and refurbishment. Felt a little pricey for B&B versus other locations on our stay in the area. Lovey modern clean bedroom with plenty of space. Restaurant was nice and relaxed, food was good especially breakfast which was excellent. Staff at reception were very good as were staff in the restaurant. Great central location in a wonderful town.